One Million Years B.C. Polish film poster (1966) | 'TAIN'T THE MEAT… IT'S THE HUMANITY! 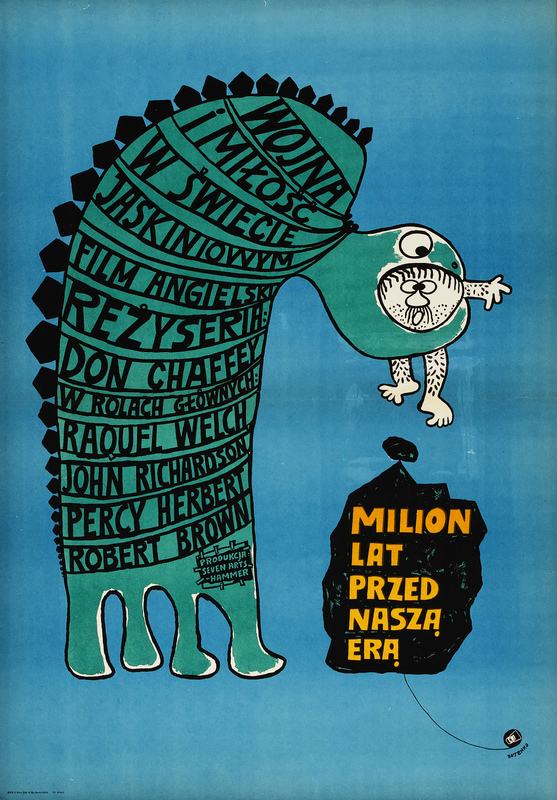 This film poster for the Polish language release of One Million Years B.C. features a charming cartoon by illustrator and graphic designer Bohdan Butenko. Released by Hammer in 1966 the film starred Rachel Welch (in an eye-popping fur bikini), John Richardson and a host of dinosaurs animated by legendary animation maestro Ray Harryhausen. It’s all silly fun, ably reflected by Butenko’s wonderfully off-beat poster. Butenko, a celebrated artist and author in his native Poland, eschews the famous image of Welch in that bikini and instead created a cartoon dinosaur gobbling down a hapless cavemen. It’s simple, sweet and bold. The white of the caveman contrasts nicely with the green of the dinosaur and the solid blue background, while the orange text of the film tile pops out nicely. With a poster this bold and eye-catching it hardly matters that the image has nothing to do with the film itself.